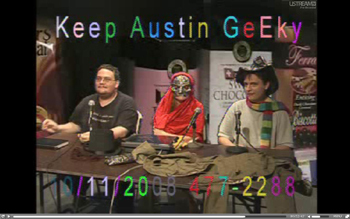 Daniel Krawisz (right) and Lorraine Denardis (center) host "Fun with CGI" on Austin public access. Public-access television is a sometimes bizarre world where anyone with the time and inclination can appear on television. It’s where you find the rants of Colombus, Ohio, goth Damon Zex and the strange instructional videos of Let’s Paint TV, where Los Angeles host John Kilduff taught viewers how to paint and make blended drinks all while exercising on a treadmill. Then there’s my personal favorite What’s Your Problem?, the story of a man having a hard time eating a fish. You’ll notice that all those videos are now available online. In an age when it’s increasingly easy for amateur filmmakers, citizen journalists, and the general public to distribute videos online, is there any point in having a public-access cable channel? Some argue that public-access television has outlived its usefulness for this reason: Podcasting and online video have effectively eliminated the need to reserve television slots for public comment. In recent years, telecom companies have used this argument with great success to get out of having to contribute public-access funding. Lack of funding and public interest have caused many of these stations around the country to close up shop. So if public-access dies, should we mourn it? Is there any reason to preserve it when it’s so easy to put the same material online? Advocates argue that online media can’t entirely take the place of the classic cable-access model, and that TV call-in shows offer a different kind of interactivity that shouldn’t go away. Public-access television came about with the rise of cable television in the late ’70s and early ’80s. In exchange for the rights to lay cable wires on public land, cable companies were required to donate a portion of their revenue to provide facilities and airtime to allow public comment. (Such agreements are negotiated on a city-by-city basis). The idea was to give voice to ordinary citizens who otherwise wouldn’t have access to any media outlets. In 1984, the Cable Franchise Policy and Communications Act prohibited cable operators from exercising any editorial control over public-access channels. Thus public-access TV mostly became famous for its eccentric personalities and bizarre shows. (A few break-out stars even got their start on public access, like comedian Tom Green and horror hostess Elvira.) But it’s also been a venue for serious political and philosophical discussion, a place to find the recorded minutes of your local town hall meeting or school board discussion, as well as a springboard for citizen journalism. In the 1990s, Lisa Hendrick videotaped city council meetings in Marine City, Mich., to expose inappropriate behavior by elected officials. And many public-access stations rebroadcast investigative pieces by Democracy Now, Free Speech TV and Deep Dish TV Network. At the moment, the most obvious advantage public-access TV has over online video is simple access. It’s sometimes easy to forget that not everyone has access to a computer, but the 2008 biennial news consumption survey by the Pew Research Center for the People & the Press found that 46 percent of Americans still get their news and entertainment primarily through television. Tony Shawcross, executive director of Denver Open Media in Denver, and founder of Deproduction, won a grant from the Knight Foundation to create online tools for public-access TV stations (and blogs on Idea Lab about it). Shawcross told me that cable TV still predominates the media landscape. But this is only a temporary respite for public access. As technology becomes cheaper and more people become plugged in, this gap is slowly but surely narrowing. Even though experts estimate that it could be another 20 years before online video reaches the same audience numbers as cable TV, activists agree that public access will need to find another way to justify its existence. Part of the appeal of new media is that you no longer need a big crew or expensive equipment to record your message. When you can film yourself with a cameraphone and upload it to YouTube from the privacy of your own home, what’s the need for a public access center? Dedman worked at Manhattan’s public-access channel from 2001 to 2006, but eventually left because he felt that it was falling behind as new technology became more available. But before he left, he had become increasingly interested in video-blogging (or vlogging), which he saw as the next step. Dedman has worked to teach public-access producers how to harness the power of vlogging, including a stint at SFaccess in San Francisco. Public engagement is at the heart of public access, and proponents see it as a place where a local community can gather to learn how to communicate and share ideas. Dedman recognized that public access will need to adapt to the new online reality if it wants to continue fulfilling this role. There’s little point for a station that only offers classes in archaic technology, after all. Currently, some public-access centers are reluctant to branch into new media out of fear that offering such services might breach their contract with cable companies. Dedman noted that cable providers are reinventing themselves as broadband providers and said that savvy public-access stations needed to renegotiate their contracts to “get a piece of whatever was going over the wires” — to ensure that cable companies wouldn’t be able to revoke funding for offering media services beyond TV. Shawcross has been the forefront of change in public access. He pioneered a number of innovations to energize viewers about public access, making Denver Open Media channel a leader amongst public-access channels. Shawcross also emphasized the local aspect of public access, where channels are unique to a city. The idea of local public engagement goes beyond just giving the public a way to appear on TV: It’s also about giving the public a chance to talk back to TV. Interactivity is, of course, a huge part of online media, but public-access personalities agree that the responses on television have their own distinctive flavor. Russell Glasser co-hosts Austin public access show, The Atheist Experience, a call-in discussion show that promotes positive atheism, and produces an associated podcast, The Non-Prophets. He’s used to getting challenging or hostile calls on the TV show, while the podcast attracts a more sympathetic audience that is interested in atheism to begin with. Daniel Krawisz and Lorraine Denardis host another Austin public access series, the Libertarian-themed Fun with CGI. Denardis thought that most viewers found “Fun with CGI” by chance, an element removed from online searching. Search engines have improved at returning only the results that you want. But if you’re less likely to run across something unexpected, you’re less likely to accidentally find something that might startle you. In contrast, you rarely know what you’ll find when channel surfing — and that element of chance might make TV more likely to challenge your preconceived ideas. Many shows are broadcast live and invite viewers to call in — and the responses can often be just as entertaining as the show itself. 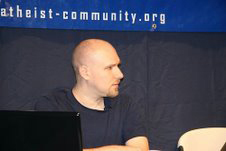 Glasser and his co-host Matt Dillahunty have made extensive use of new media to help get the message out about their ideas, but, ultimately, it was the unique public-access callers that made the show popular. Krawisz of “Fun with CGI” noted that the public response the TV show received far surpassed that of its online counterpart. For now, public-access TV still seems to have a place, but its future is far from certain. As more people switch their attention to online media, it’s likely that the appeal of appearing on TV will diminish. But public-access TV is about more than just letting people speak their minds, it’s also about teaching them how to speak their minds; that’s one thing that you can’t get by sitting at home alone, uploading to YouTube. For Shawcross, the only thing that could adequately replace public access would be something that provides both equipment and training — and makes sure that it’s available to everyone, regardless of income. “If libraries were providing media training, Internet access…and access to production equipment, then I’d agree that perhaps public access would be irrelevant,” he said. What do you think? Is public-access TV still important or is it a relic of a bygone era? How would it have to change in the future to stay relevant? And, if you’re a fan, what shows do you watch on public access? 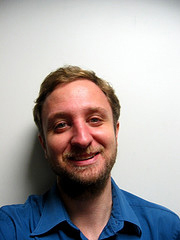 Mike Rosen-Molina is a Northern California freelance reporter and an associate editor for MediaShift. A graduate of the University of California at Berkeley schools of journalism and law, he has worked as an editor for the Fairfield Daily Republic and as a managing editor for JURIST legal news services. “Fighting for relevance”? That’s odd coming from a PBS web site. The public broadcasting audience share has declined by half over the last 20 years, barely registering over 1% today, yet they question the relevance of public access TV. The fact is public access stations fill the gaping void left by public broadcasters too timid to live up to their missions. Instead they whore for viewer dollars with an endless array cooking shows and home improvement claptrap. Thanks for the elitist distortion – if PBS doesn’t do it, then who will? An effort to bridge the gap between public access t.v. and internet video is beginning here in Ithaca, N.Y.. Our Public access facility has provided a starting place for citizen video journalists by providing instruction in use of equipment, studio, and editing. Certainly that was true in my case. We need better access to both cable and internet video. However, there has been a lot of defensiveness that has come out of the recent efforts, particularly in LA, to gut public access. The need for good production value pertains for both modes of distribution. Doing on-line video well may demand a higher level of technical sophistication that the article suggests. I really appreciated the reference to the synergy between both media. That definitely points the way. It’s always been about introducing to the public the bureaucracy of production. Ironic that at our local public access outlets in Boston and Cambridge that there have been a number of important failures. At our Boston Neighborhood Network News http://www.nnnonine.org the anchorman failed to make available online the news broadcast that more people would have access to the content. Rather than a local type of person an anchorman has been brought from another state contrary to the very principles of local public access. It’s even contrary to giving the talent doing the news segments more opportunities for wider recognition. At Cambridge Community TV CCTV across the river it has been about “membership” and limiting viewers’ participation. Studio live broadcasts have failed to be organized with a floor director checking that things are working during a broadcast, for example audio, camera, telephone call in equipment, etc. City boundaries shouldn’t have limited viewers’ access to the broadcasts. But community cable does limit access that adjacent neighborhoods in different cities haven’t had access to each others’ broadcasts. Years go by but the public access studios have been in denial not making more broadcasts available across city and town borders even though we live our lives not only within our city borders. We should be able to share public access broadcasts with our families and friends and enterprises in neighboring towns. One thing the article leaves out is the lack of public access on satelitte providers. The growth of these other tv providers is tremendous over the past 15 years. Ask any Dish or Direct tv customer and I’m sure they will say they have “cable” but are missing public access tv. The problem isn’t just the internet, it is keeping up with how people even access regular tv. On top of all this, one thing is normally left out in these type of discussions. People talk about equipment, training even the problem of not everyone having internet access. What is often ignored is time. The time it takes to create a short video on a cell phone (which in the US seems to transcend all economic lines) and get it uploaded to the net. Compare that to the time to just drive to your public access station. That alone can take more time not to mention having to reserve a slot in advance to ensure someone can operate the equipment or taking the time to learn how to run a tv studio yourself. That is the problem with public access vs the net. The net is NOW and, unfortunetly I think, not enough of the next generation care to learn about it or due to sat tv even know of public access. The argument of just stumbling on public access is interesting and certainly something the net has a tough time doing. The part about the tools not being in low income communities doesn’t hold water either here is why: 1. The number of computers in libraries and schools far out number public access tv stations. Where I live people in some of the low income areas would have to drive 20 miles to get to the local public access station. Their local library is maybe 1-10 miles not to mention countless schools. 2. Video devices are cheap either a cell phone or flip cam. Not broadcast quality but cheap, quick and easy. 3. Free/cheap and easy to use video editing software puts more control and can be less intimidating to a low or any income person than coming in and worrying about looking stupid (in their mind not saying they are). I’m not against public access tv but think the real problem here is very similar to what newspapers, radio and commercial tv (or any other media) are facing with the net – how do you stand out in the crowd anymore? As one of the folks interviewed for this story, I wanted to make sure I comment here. Mike does a good job setting up a needed public discussion. I think the last quote is a bit of a “gotcha” moment. A library doesn’t have the interactive quality that the best PEG stations have. I know I learned how to be a media activist by working with dedicated people producing programs on topics I’d never seen publically discussed. I was given time and space to experiment with people helping me learn how to speak for myself. This face to face interaction is different than posting videos to youtube alone in my apartment. My big point is that the web was not a communication tool when PEG centers were created. But now it is and should be a major portion of any Access center since it’s a great way to distribute media and connect people. The challenge I’ve seen is that Executive Directors of PEG stations are facing increasingly hostile city councils and cable companies who are finding any excuse to cut funding. The internet is used as an excuse to take away the physical locations where people meet and learn. So there is a fear of being “too web savvy” because it may undercut the actually reason for a station’s existence. I advocate that PEG stations demand that internet access become part of the contract. Each station should receive cable TV channels, but also a 10-megbit fiber line into the station. Let it be known that there are literally hundreds of public access stations around the US. Some stations are spearheading this change. Others are slower. The best thing to do is get involved in your own local station and help them understand what you need to make media. How do I host my own Movie show on PA with films not shown on TCM or AMC. It would have a host, film historian, amybe celeb guest involved with the film,and a couple of film fans. It’s a shame the writer of the article didn’t include any of these realities you point to, Jay. It would have been a better article. As I watch Lawrence Welk reruns for the nth time on my local PBS affiliate, I am actually confident that community television stations are more representative of the communities they serve. Unfortunately, public access and community tv operations just don’t have marketing, planning, fund-raising and lobbyists on staff or on contract to make their organizations stronger. That’s where the challenge lies. I am glad that Mike brought up PBS affiliates. Now that I have installed the converter box, I get so see all the extra PBS digital channels. I think it would be great if we could have some blocks of time for community access t.v. on some of these extra digital channels. It is, after all, the people’s airwaves. The article did not mention the Miro Local TV initiative. Here is a URL where you can find out more about this promising effort to localize internet video and offer a non-profit alternative to Youtube that would be coupled with existing public access t.v. communities. Nevertheless, good food for thought here, thanks. I think the only reason public access gets compared to youtube all the time is because of the similarity of some of the content: amateurish, raw, or otherwise “unprofessional.” I emphasize the word some here. Otherwise they are both totally different mediums, both with their own qualities. A public access tv channel was always less relevant for someone without a tv or cable, and the same could be said for someone without a computer or good internet access. In the end, public access television is a foundation for community media in many places- and should be built upon, not undermined by arguments about relevancy. I don’t think there will ever be ONE best or most relevant way to build community, just more. Our station provides live coverage of two different town’s select board meetings as well as live coverage of the high school basketball games. We also make DVDs available for rent as the town’s video store. You will never see any of our programming online, or on the Dish. I am the Production Coordinator for our tiny station here in rural Vermont. Amazingly, our programming is highly prized in our town. People LOVE seeing the select board meetings, they can keep tabs on their officials without actually attending the meeting. And Basketball is our town’s #1 sport. Well, that will NEVER happen. Our provider HATES funding our station and their representatives have made it clear that there will never, ever be any funding for programming delivery in any other medium.. They demand detailed reports and question every expenditure for non-cable related expenses. I come from the film and theater production world. I work really hard to train our producers to make a quality product. The in-house productions (meetings and sports) are well made, with good sound and picture. We are the only station in Vermont to use a three-camera shoot with table mics for the board and wireless beltpacks at our meetings. It isn’t lack of interest, it is mostly the unrelenting assault of the cable companies with very deep pockets that force the closure of the only public access to TV broadcasting available. Public Access teaches the average person how to make better videos than just using their cell phone camera. It needs to be vigorously defended. PUBLIC ACCESS IS COMPLETELY DIFFERENT THAN “YOUTUBE”. PUBLIC ACCESS TV REQUIRES A RELEVANT QUALITY OF CONTENT, AND STILL GOES INTOT EH “LIVING ROOMS” OF AMERICA. ITS TV. AND TV IS STILL THE MOST WIDELY SEEN & POWERFUL MEDIA IN THE WORLD. FREEDOM OF SPEECH IS ONE OF OUR MOST IMPORTANT RIGHTS, AND SHOULD ALWAYS BE. I BELIEVE THAT IF ANYTHING, FREE TV, AND PUBLIC ACCESS, WILL HAVE A RESUGEANCE, AND BE MORE POPULAR THAN EVER, IN THESE ECONOMIC TIMES. DTV & SATELLITE SHOULD BE REQUIRED TO OFFER “LOCAL” & PUBLIC ACCESS, TOO. PHOOEY ON YOUTUBE,IT HAS NO QUALITY REQUIREMENTS, AND MOST VODEOS BECOME “LOST” IN A SEA OF MEDIOCRITY & GARBAGE. shut up loud mouth all caps poster.. how rude can you be ? Hope folks get down to my comment cause this is at the heart of the debate. Of course Cable providers seek ANY excuse to get rid of Public Access because it costs them $ and uniquely provides both training and a mouth piece to voices that run counter to their interest. But, make no mistake, the public having ACCESS to the basic cable tier is even MORE vital now as TV and web merge. Its now SO EASY to lose local, political and cultural relevance in a sea of internet channels, that the community MUST HAVE a space dedicted to public discourse, an “electronic town square” of sorts. The education, cultural ties and inter-active communication that local communities get uniquely via cable access to both post and receive information specific to their concerns can not be underestimated nor duplicated elsewhere. The real-estate known as BASIC CABLE is therefore the CRITICAL gathering place from which all other web, print,radio or other media can spring. Big I-net and cable companies realize this. That’s why you have companies like MS/NBC and AOL/Time/Warner. These companies realize that one hand washes the other and its not only critical for TV to have the web to maintain its relevance but vice versa as well, particularly in an increasingly dilluted internet market-place. So to relegate local concerns to a place “somehwere out there” is to marginalize YOUR community, YOUR voice. The question isn’t “Is public Access relevant” but “why is there not more?” Why, with all the billions that the cable/internet industry makes is there not a greater set-aside for an electronic park? A public green space? Again, as the proliferation of internet video continues, big media companies use their basic cable presence as a portal, a gathering spot. This generates a crticl mass of viewers and users for all other related (and integrated) web excursions. As Public Access grows it will invariably expand to more new media. But, it must also take its cue from big media in important ways. Therefore the web should be seen as part of an integrated market strategy, to provide access to more users, not as a parting consolation prize. After all, the cable “real estate” operates over the public right of way. Last I checked, this still belongs to us. Is it legal to record public access tv and post it on youtube? Public Access was basically wasted bandwidth before the video on the web explosion and now it is even more worthless. Let’s spend this money in something that contributes better to the community. It is what the community makes it. Ours helps Second language learners with informing media in two language; shares inspiring stories, and enables in-depth look at community issues from multiple perspectives, teaches digital media skills, and more. If yours is worthless maybe you did not do enough to change that. As both a PATV producer and a video blogger, I know that my videos are seen by far more people on TV than online. And via PATV, they reach people who would never have sought them out online. It’s the difference between push (TV) and pull (internet). The corporations will not rest until all alternative voices are silenced. We need not acquiesce in this. In high school, I ran a TV show called Tecker 911 that introduced people to technology. http://911.tecker.net I thought of it as a podcast first – prerecorded, on my camcorder, edited on computer, released online by us to our site and to YouTube. However, it was on my school district’s channel as well. We were the only show on there so it was not like a normal part of the channel. I don’t know how many people watched on TV. I know a few did because people recognized me in stores. I know the YouTube version got thousands of views each. (The programs were not locations specific). I think it was good to have both – it was more visitors than either alone. As I mentioned, I thought of the internet version as the primary. I think that everything should be on demand from the internet – and that the TV should continue for the discovery aspect and people without broadband. “If libraries were providing media training, Internet access…and access to production equipment, then I’d agree that perhaps public access would be irrelevant,”@1990 public access was in the library of a nearby town and I thought “These folks get it, they are so ahead of our time. This maybe a good place to live someday.” 3 years later that changed and the survival of public access was challenged for the next 2 decades because free speech was a “liability”. Public Access has always been what the community makes of it. The more it engages THROUGH the diversity of ideas the more sustainable it will be. Difficult in a world of silos and echoes and cute pet videos low budgets and predominance of vanity TV producers. Its interesting to see that this article is 5 1/2 years old now and technology has changed somewhat since then. Managing a public access studio for 5 years, I have seen how it has changed since when I began. Adele Houston is right when she mentioned how public access is what the community makes of it. If the community is not only aware of the facilities but wants to be a part of the public access facilities, then you will have more sources of diversity and view points. Also, the education of the demographic that comes in determines the quality of shows too. If most of your people have minimal TV skills and interests (no matter how well you train them) then their show will reflect that. If people aren’t watching public access its because they either: don’t know about it or aren’t interested in the quality of programming on it. Since this article was published in 2008, not only YouTube has grown but also social networks like Facebook, vlogging, and blogging. The newer generations don’t “channel surf” on TV as much because there is a digital TV guide that tells you whats on. Or they just surf the web thanks to Google. Plus, with HD channels emerging, people with HDTVs don’t bother to watch the lower SD channels which includes public access. More and more people are on their smart phones and digital devices interacting that way. If public access wants to survive, it should take on the path that Jay Dedman suggested which is to incorporate newer media training in their facilities. Having the studio space is still needed because of the physical interaction with community members, but the media outlets to get your message out is becoming more favorable to broadband AND cable TV vs only cable TV. Public Access TV and the question of relevancy has not seen much progress since 2008 because the basic premise remains that it is what the community makes of the tools and the hyper-local stage with now global potential with new media. It should be more relevant as a place of discovery & connection and purpose than ever before but so many still have no idea that it exists for them. Maybe as more organizations need to collaborate to survive our media tools can be of more value. Maybe.